The Gemini Apes, a 90 minute audio movie from popular writer/producer Dirk Maggs aired at 4:00pm Christmas Day 1998 on BBC Radio 4. Dirk explains, the idea for The Gemini Apes is eight years old. "We did the Superman stories in the late eighties," said Maggs. "In it was a line from Jonathan Kent, when he found the infant in the capsule, that went, 'They've been sending up monkeys and dogs, so I guess they can send up babies as well.' It planted the idea in my mind. They used chimps on the Mercury program, and what happened is a kind of superchimp arrived. That's where it came from. Instead of being E.T.ish I thought it better to have two, so they were a little team. I asked myself, if they were intelligent and came back 30 or 40 years later, what would they want to do, and the answer is they'd want to release all the other animals to save them from a similar fate, from the depravations of mankind. So I thought maybe they should be up there a long time and acquire intelligence. Man isn't the hero of the piece, but he isn't exactly the villain either. The fact is we've been so rotten to the animal world that it doesn't really want to know us. I thought that was an interesting idea. "I decided maybe these chimps had been used for research into the immune system to fight disease, and when they came back they discovered, purely by chance, they contained the key to antibiotic-resistant bugs. It's becoming a real threat to western medicine. People are dying. In fact, one of our actress' mother died of antibiotic-resistant tuberculosis. So it's become very timely. "When I wrote it I described The Gemini Apes as a space age fairy tale, but it's come true in all sorts of ways I hadn't realised. The script was already written and I sent it to Doctor Amy Parish, an expert on bonobo chimpanzees, which our chimps are, and she said most of this stuff is accurate. That was the really weird part. I was working on the principle of Edgar Rice Burroughs, who'd written the Tarzan stories when he'd never been to Africa. I wanted to tell a little moral story. When Amy told me a temporary injunction had been awarded against the US Airforce selling 115 space program chimpanzees to a biomedical research firm with a terrible record in animal care, you could have knocked me down with a feather. I said to her, 'Forget the space age fairy tale; I've now decided it's a work of investigative journalism!' which was a joke. In fact, in the week of recording it there was a documentary about the plight of chimps in the US airforce (Thursday 1/10/98 BBC 2 Horizon). I had no idea about how current an issue it is; it's quite astonishing. Without meaning to it's turned into a topical item." After training as a drama teacher, Dirk Maggs was a studio manager for BBC Radio, working mainly on comedy. In 1988 he became producer in radio light entertainment. 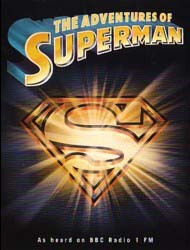 His first project, Superman on Trial, a 50th anniversary docudrama, was well received by Radio 4. After 1989's Batman - The Lazarus Syndrome, Dirk returned to Superman. 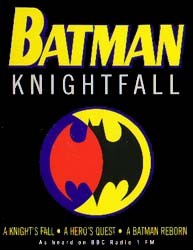 When Matthew Bannister took over Radio 1 he approached Dirk for a daytime serial and the excellent Batman - Knightfall was born. The Amazing Spider-man and two Judge Dredd tales were next, the first of which won the Talking Business award 1995 for best production. Dirk joined forces with Paul Deeley and Phil Horne at The Soundhouse to create Audio Movies Ltd.
After a Los Angeles set visit on the blockbuster movie Independence Day, Dirk returned home to script and produce his own 60 minute audio version for Radio 1, starring Patrick Moore, Colin Baker and Toyah Willcox, as before in superb Dolby Surround. 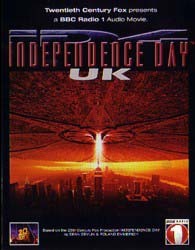 Independence Day - UK was Dirk's first foray into film-related material and, aside from winning him the Talking Business award for the second time, it made quite an impression when released for sale. "It reached number 66 in the album chart," he confirms. "Quite an achievement for a radio production." The Gemini Apes sees a new departure for Dirk, being the first totally original project not based on a comic book or movie. "That really is the point of this, that I was actually in a position to not worry about it belonging to someone else," said Maggs. "As an idea of my own I was able to take it wherever I wanted. It makes a change from having to deal with people who own copyrights. It can get terribly difficult - what you can and cannot do with their character. Quite understandable, but tiresome." BBC Radio were initially reluctant to take on an original story. 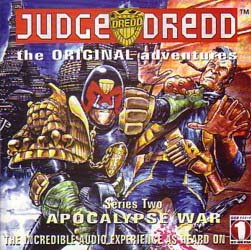 "Radio 1 were very happy to take Superman, Batman and Judge Dredd, but never really interested in original stuff. My whole idea was to move on to doing original material in the style of the Radio 1 audio movies that we'd been doing. Audio Movies is the name of the company, but it does describe what we do. So many people will say we do radio versions of films, which is absolutely not the case. We've only done that once with An American Werewolf in London, which was brought to me rather than me asking for it. We produce stuff in the style of cinema but without the pictures, because we think it works just as well. It's not a radio play as people understand it from the BBC. I'm not decrying radio plays, but I absolutely believe that what people want nowadays is much more to do with cinema and sounds from commercially produced music. They want something big and exciting that grabs them and sweeps them along, and most radio drama doesn't do that. "The world is run by marketing these days, and it doesn't like anything new because it means you've got to acquaint people with it. I pitched it at James Boyle, the Controller of Radio 4; he was 'umming' and 'ahhing' a bit because it was an American subject, which is fair enough. But to his credit he decided to take a chance, and we discussed that we might be able to get a couple of British voice artists." A project collapsed at the eleventh hour through nobody's fault, and Dirk was given just 24 hours to fill a slot on Christmas Day for Radio 4. "Of course, that's good news and bad news. It's a very hard day to attract people away from television on, but it's also a prestigious day if we bring out something that's very different. So it became a sort of millstone and I was worried. But I'm pleased with the result and I think it's going to be a great product. I'm hoping if it proves popular, then we will get to have more on the radio. "I'd actually written the idea of The Gemini Apes up as a short novel/film treatment which I was trying to sell to people. After we did Independence Day - UK I sent a copy to Dean Devlin who said he would read it; then Dean and Roland Emmerich went off to write Godzilla and they didn't have time to read it, so it came back to me. It had actually sat at the agents in Los Angeles for some time, and to my horror about six months later I saw in, I think Daily Variety Report, that there was a project being sold to Jerry Weintraub in Hollywood, who just did The Avengers, called The Mercury Effect. It was basically my plot. "Somebody had either amazingly come up with exactly the same story, or worryingly had stolen my idea and adapted it to their own purposes. So that completely crushed me; I thought that's the end of that, it was a good story but what the heck. I was trying this year to publish it as a children's book, but of course English publishers aren't interested in American subjects. Then this summer I thought I'll write it as a film script and have my agent send it out, and maybe someone will see the value, buy it, and it might just see the light of day, in the shadow of this other film, if it ever happens. Be the poor relation, but actually the original. I felt very bitter; the best way to get out of this negative attitude was to write the film script. I had literally just finished it when this slot for Christmas Day came up, and James Boyle rang up and said, 'I'm really sorry, we have a slot and I want you to fill it.' I'm thrilled to bits really, because it means, as should be the case, the original idea of The Gemini Apes gets out before this movie, if this guy did decide to appropriate my idea. If it's a coincidence then good luck to him, but at least I've managed to make The Gemini Apes public." In assembling the cast Dirk employed tried and trusted voice artists, as well as introducing some which were new to his work. "The part of Nadia, the granddaughter of a great Russian geneticist who is involved with the apes, I was going to give to Lorelei King, who I'd worked with on the comicbook stuff, but in the end radio wanted an English actress. So I had the invidious task of asking Lorelei if she'd mind not playing the scientist, but play a chimp, which was an interesting phone conversation! But she's a sport; she had a go and turned in a brilliant performance. Gary Martin (also in Spider-Man and Judge Dredd) did all the primate voices except one. The man with the deepest voice in showbusiness, deeper even than Christopher Lee. I was very pleased to get both Gary and Lorelei. I was worried up to the first day of recording that if you couldn't believe these chimps were talking, there would be a big hole at the heart of the show. But with very little treatment they came up with voices that were superb. "I originally had in mind William Hootkins (Lex Luthor in the Superman stories) as Drake. But he was not available because he was working on a film. 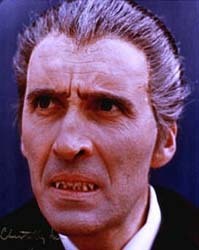 I was left with the problem of who to get, and somewhere in the back of my mind was Christopher Lee. So when Bill Hootkins was suddenly unavailable I rushed off to find out if Christopher was free. Thank God he was and he liked the script. I was very pleased; he turned in a wonderful performance. The character of Professor Drake is a villain up to a point, but a practical man who is trying to survive in his own world. 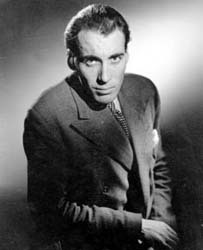 Christopher Lee needs no introduction, but it's worth pointing out that he's been in the acting business for 52 years, and is still going strong. What appealed to Christopher about the script? "The story is set in the US," said Lee. "I play an English businessman, an immensely powerful tycoon, who has got involved in this strange experimental world where the genetic make-up of animals is transferred to humans. Not only is it a fascinating story, but it's almost the truth. It's the sort of thing that's actually happening in the US today. They're experimenting with combinations. To me, this is tampering with nature. If it's for the benefit of humans there's a lot to be said for it, but not if it's misused for the sake of money. In this case, as a typical businessman, my character's ultimate aim is money. But it just so happens that if the experiments work out, and this particular one child who is terminally sick is cured, that gives him public persona. So he covers up the fact he's in it for the money by appearing, in terms of public relations, to be a great benefactor. These apes are sent into space and return years later, almost humanised in terms of intelligence; this man and others want to use these genetic qualities. "Dirk got on to my agent, and I said I would do it. It was all rather at the last minute. It was only a go project two or three weeks before recording. I never do anything without reading the script; in many ways it's the most important thing. I look at what I'm asked to say and decide whether it's worth doing, and if I can make a contribution to the story. I judge every film on that too." But is there any room for character development in radio? "Yes, but it's extremely difficult," said Lee. "You're working in one medium: orally; at the same time, through the ears of the listeners, you've got to make that character visual. They've got to hear you and say, 'I know that man: this is his age, his shape, these are the clothes he wears.' Unless it's specifically said, you've got to create a realistic character. It's the same as if you're giving a performance in a film or a play, but acting with only your voice. When you're doing it you've got to think that you're acting for an audience, only they can't see you." Christopher Lee is still regarded by many to be an icon of horror. Has he ever felt restricted by this? "Well, people make this statement; it's not true," he said. "I haven't done a film like that in 26 years. Maybe it was because of the impact of the pictures when they came out, which are remembered by my generation and others. But the only reason people still connect me with those films and characters is television and video. "Sometimes they're not even aware of the fact some were made 40 years ago. I'm practically never approached as a horror actor anywhere in the world. I don't know if people are prepared to believe it or not, but it's the truth. When people come up to me, and I'm glad that they do, it's usually the same conversation: 'Can I shake your hand?' and then quite simply, 'I do enjoy your movies very much.' In fact, now I'm getting more fan mail than I've ever had in my entire career. It's becoming a bit of a problem, actually. And I'm being offered more work than ever. I have to say that I'm saying 'no' to a good eighty percent, but I say to people I'm doing something I haven't done before. What's the point of repeating it? I had to do that at the time, but it was a very long time ago." Thanks to Dirk Maggs and Christopher Lee for their time. Note: Dirk would like it known that he has recently (April 2002) received correspondence from a close friend of The Mercury Effect screenwriter, who has assured him there was no connection between the two projects. Coincidences do happen, and Dirk is happy to accept the man at his word.